Pluto was discovered in 1930 by Clyde Tombaugh, and first visited by the New Horizons spacecraft in 2015. We originally thought the Solar System only had two zones: the inner rocky planets and the outer gas and ice giants, Pluto didn’t fit. Pluto and the other small icy bodies discovered afterwards define what we now know as the Solar System’s third zone, called the Kuiper Belt. New Horizons showed us that Pluto has tall mountains made of water ice, very bright areas, and dark reddish areas. Sputnik Planitia* is a big low plain of frozen Nitrogen, and Nitrogen glaciers flow into it from the east. Charon’s water ice surface expanded long ago, stretching apart to leave big cracks and cliffs. 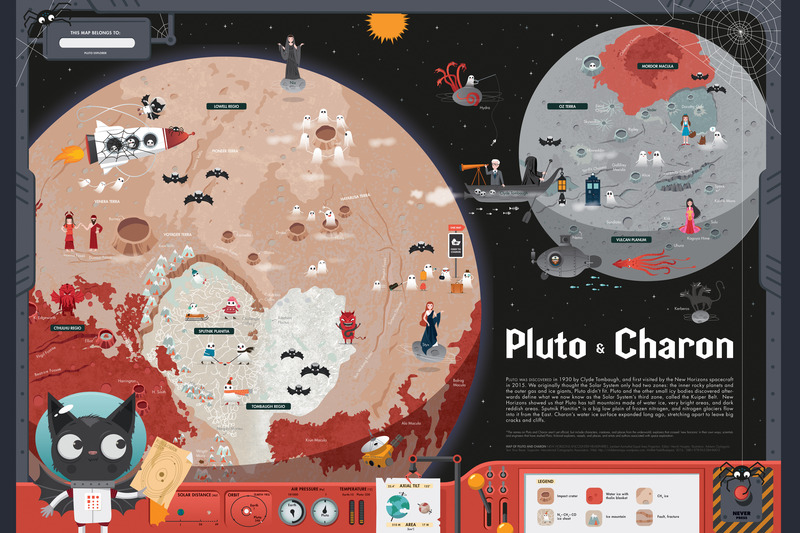 Nomenclature*: The names on Pluto and Charon are informal, and include characters, creatures, and places from the underworld; explorers that crossed ‘new horizons’ in their own ways; scientists and engineers that have studied Pluto; fictional explorers, vessels, and places; and artists and authors associated with space exploration. Age: cratered terrains on both Pluto and Charon are 4 Gyr old, but smooth ice plains on Pluto are very young. Highest point: to be determined. Sputnik Planitia is a deep and very smooth surface. Large cracks on Charon had >10 km high steep slopes. Water ice, the material of rocks, is granite hard at these very low temperatures. 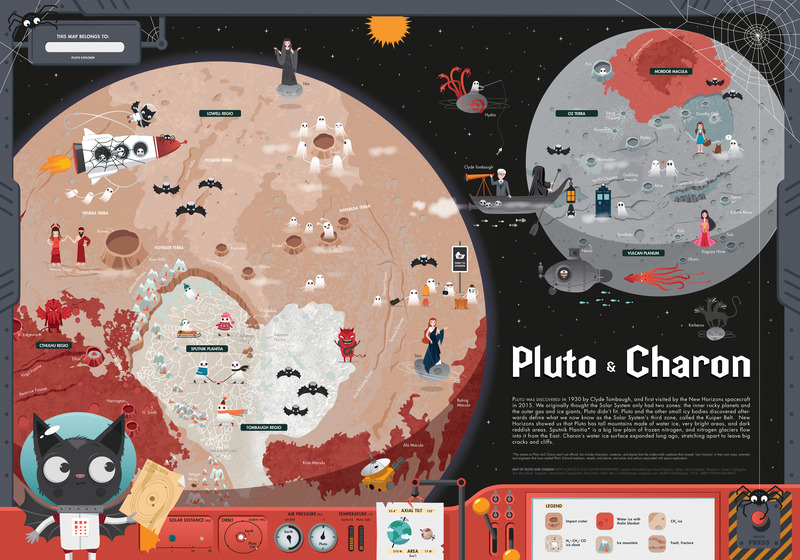 Pluto-Charon map: (Illustrator: Adrienn Gyöngyösi). The map uses the theme of Halloween that is the closest to the Greek underworlds myths. Unlike other maps, this map depicts only one hemisphere of two bodies because only one hemisphere was photographed in detail when New Horizons flew by the system. The sizes of Pluto and Charon are to scale. The southern polar areas were in darkness so it is completely unknown. The four other, small and irregular moons are also shown on the map with the mythological character they were named for. The surface of Pluto and Charon is both composed of water ice rocks, and in places a reddish brown material is covering it. This material is called tholin and is produced in the atmosphere as the Sun’s radiation interacts with atmospheric molecules. The left “lobe” of the large “heart” shaped bright feature is partially a large, deep, ancient, elliptical impact basin filled with ice. There are four kinds of ices on Pluto: nitrogen, methane and carbon-monoxide ices in addition to the bedrock, which is water ice. In the past, the extent of ice cover was different. Pluto has a very elliptical orbit around the Sun so some of its ices may sublimate when it’s closest to the Sun. Pluto and Charon are tidally locked to each other so they turn the same side towards each other and they orbit around their common center of mass, an invisible point between Pluto and Charon. The small satellites are affected by both Pluto’s and Charon’s gravity (depending on when they are closer to which) so their orbit and rotation is somewhat irregular.